10 – It has been speculated that the 119-year old Hume Hotel & Spa in Nelson is haunted. Voices and movement from the spirits have wagged a few tongues, but the Hume (today) continues to be the ‘Grand Old Dame’ of Nelson. 9 – St. Eugene Golf Resort Casino offers deluxe guestrooms, housed in the original Mission building. In addition to its unique history, it is also home to the nearly extinct Townsend’s Big-Eared Bats. During renovations to the building in 1996, they built a roost for these bats that is sound-proofed, heated and air-conditioned (plus infrared cameras to monitor the bats’ activities). St. Eugene continues to protect this colony that returns each year. 8 – If quaint Victorian-era hotels peak your interest, one of the finest examples is the Leland Hotel in Nakusp. It is the oldest continuously operating hotel in British Columbia since 1892. 7 – Perched at 2,347 m. (7,700 ft.) above sea level, Eagle Eye Suite at Kicking Horse Mountain Resort in Golden, is one of the highest sleeps found in the Kootenays. A stay at this mountain top suite comes complete with a private chef, butler services and some of the most spectacular 360-degree mountain views. 6 – Built in 1935-37, the Lakewood Estate & Blaylock Mansion was originally a private residence for Selwyn Blaylock (Cominco’s General Manager of Trail’s Smelter). This retreat along Kootenay Lake offers manicured grounds (including a 65’ x 30’ swimming pool and a warmer swimming lagoon), a whirlpool spa, sauna, tennis court, croquet or bocce ball lawn and lakeside docking facilities. 5 - Kootenay Park Lodge (formerly known as Vermilion River Camp) opened its doors on June 30, 1923 and was the first property on the Banff-Windermere Highway that travelled through Kootenay & Banff National Parks. The cabins were built in the 1930’s by CPR and has been welcoming guests for over 90 years. 4 – Emerald Lake Lodge is on its own island in Yoho National Park. Dotting the 13-acre peninsula are 24-cabin style buildings, built to reflect the traditional architectures of the main lodge. 3 - If you wish to wake up listening to the Blaeberry River, then the 8-sided, straw bale constructed ‘Meditation House’ at Quantum Leap Lodge & Retreats near Golden, offers a tranquil overnight stay. 2 – Out-of-this world domed, eco-friendly structures are available at the Villa Dome Quixote, just a short drive to downtown New Denver and Slocan Lake. Views of the Selkirk and Valhalla mountains make this spot ideal for an offbeat get-away. 1 - Near the community of Wardner (between Cranbrook and Fernie) is a one-of-a-kind treehouse! Perched on a large platform 5-metres (15-ft) and built on 7 trees, Outa-the-Woods Treehouse is a totally unique and eco-friendly vacation retreat in the Kootenays. 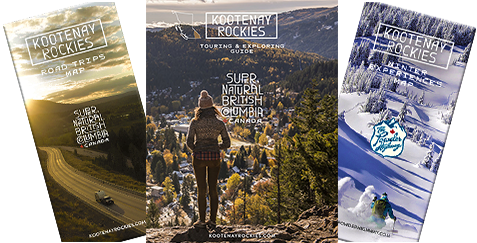 Other properties with honourable mentions include: Addison’s Bungalows (originally housed in Jasper, Banff, Lake Louise & Miette Hot Springs, these post & beam cabins were moved to Kootenay National Park and then to their current home in Brisco – standing the ‘test of time’); the Red Barn Lodge in Rossland (was once Rossland’s Dairy and today is situated on 13-acres of private grounds); Wedgwood Retreat in Crawford Bay (it has stood since 1910, as an English Country House). Story by KootRocks Staffer. Cover shot by Clair Dibble of the Eagle Eye Suites atop of Kicking Horse Mountain Resort.